Our November Bee Night project was a Secret Santa stocking. We had a full house for this Christmas project! 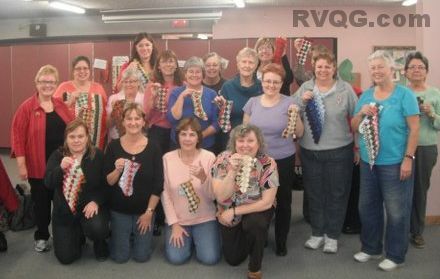 Bee Night participants used seminole patchwork to create small but appealing stockings for decoration or to fill with small presents for the coming Christmas season. The secret is out: you can obtain a free download of this pattern by Moda right here!